IPA research has repeatedly shown the importance of having an owner construction manager on the project team early. 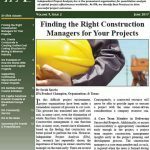 IPA’s latest competency study covering various project team functions examines the construction manager role and identifies what specific qualities and characteristics of an owner construction manager drive better project performance. IPA has seen many company-specific cost coding structures during the course of evaluating clients’ mining projects. The scope of these mining projects ranges from ore body exploration, to mine development, to stockpiling, to tailings and infrastructure projects. While the commodities, methods, and processes for these mining projects differ greatly, a review of the scope of mining projects reveals a lot of commonality across first, second, and even third level cost categories. Governments around the world, from the local to the federal level, spend billions of dollars investing in infrastructure through capital projects. As in the private sector, meeting capital budgets and delivering value to the customer are key goals. Over the years, IPA has examined a number of government-run capital projects. IPA understands the challenges these projects face. Power companies often struggle to deliver power projects close to their anticipated cost and schedule targets. They also tend to authorize project funds before roles and responsibilities and risk mitigation plans are defined. Incomplete basic designs and summary-level status updates detract from performance during project execution. IPA can measure and evaluate the performance of power projects relative to a power sector industry average and identify links between project practices and outcomes.